Integration and visual confirmation of plant conditions add up to situational awareness, which is a must-have for many of today's modern plant operators. THE factory is one of America's most prominent symbols. From the steel structures to the dedicated and experienced workers, factories--whether they are oil refineries, chemical plants, or pulp and paper mills--are thought to represent the country's ideals for hard work and prosperity. They also, therefore, represent possible terrorist targets. Safety at these critical facilities used to mean simply always wearing a hard hat. But a lot has changed. As the fifth anniversary of the Sept. 11 terrorist attacks approaches, one of the bigger news topics has become the security of America's critical facilities, including industrial sites. This has forced the typical industrial safety professional into the role of security expert, which can sometimes be a foreign area. What has become clear is that security should be addressed through a holistic approach--that is, implementing solutions that not only improve security, but also reduce risks associated with security incidents and improve safety throughout a facility. This approach combines security measures such as access and perimeter control, intrusion detection, and visitor management for a single location into a single workstation. An effective implementation of each solution can improve safety not only through situational awareness, but also by controlling some of the unknown factors that keep safety experts up at night. Many areas in industrial facilities are considered limited access or are off-limits for certain groups or individuals: the control room, process area, hazardous storage areas, etc. An electronic access control system, as its name implies, controls access to these areas while maintaining a log of who went into which areas at what time. The ability to track the time, attendance, and location of workers or contractors also makes access control systems valuable safety tools because locating individuals in real time during an incident can literally be the difference between life and death. Modern access control systems are also capable of integrating with the facility's human resources database to ensure that individuals' access privileges reflect their employment status, thus reducing the risk of workplace violence. A facility's perimeter is its first line of defense from a security threat, but it is also the first point of entry for off-site emergency responders. Being able to control perimeter access, therefore, is a critical element to maximizing plant security. Many site security solutions extend the electronic access control system to every entry and exit on the perimeter. Mustering sites are then often located at various points on and beyond the perimeter to ensure that personnel can be accounted for during incident management. Historically, perimeter control/protection was limited to fencing with barbed or razor wire. As technology has evolved, various sensor technologies have emerged to detect potential intruders. Microwave sensors are excellent for above-ground sensing applications between fences. Infrared technologies are appropriate for space-constrained and special applications. Fiber and electromagnetic cable technologies are often used on fences and underground to detect those trying to climb or cross into a plant's sensitive areas. Detecting an intrusion attempt has a number of benefits. Depending on plant processes and business, appropriate responses to a detected intrusion may range from dispatching a guard or using a CCTV camera for further investigation to initiating a production shutdown process to reduce the risk of an uncontrolled situation. Visitor management is a natural extension to an access control system that helps control visitor flow through a facility. These systems can require sponsorship of a visit by an employee and require visitors to be escorted (by badge control through electronic association) by employees. Most important, visitors also can be instantly located through the mustering application anywhere in the facility if an incident occurs. In general, visitor management provides greater knowledge of who is in a facility and where they are. CCTV technology has evolved greatly during the past few years. Jumpy, grainy, black-and-white video recorded to time-lapse VCRs has been replaced with real-time, high-resolution, full-color video recorded to digital archives accessible from anywhere in the world. A few years ago, the cost and technical limitations of CCTV systems limited their use to a few interior and perimeter locations. Today, process operators are installing literally hundreds of CCTV cameras to capture many elements of a site's operation. The stored video is used for many things: theft deterrence and investigation, employee training and location, process input and output analysis, and forensic analysis of on- and off-site events. The video and archive of these modern systems is available over the network for data mining, remote monitoring, and many other uses. Fiber fence sensors detect a disturbance in a zone in the rear of a 400-acre facility. Because the integrated industrial security solution was properly designed with minimum perimeter zone sizes, a nearby camera assigned to the zone can pan, tilt, and zoom to the location of the disturbance. The real-time image is displayed to the security personnel, providing them with real-time data on the person, animal, branch, etc. that caused the disturbance. Based on that information, security personnel can choose to dispatch a guard, call for help, or ignore the alarm. On a pharmaceutical production site, an operator has mandated visual confirmation of each person allowed access to a storage room where highly valuable, dangerous substances are kept before being processed. When an individual presents an electronic access control card to the reader near the entrance, his/her staff photo from the human resources database flashes up for the operator to verify. The operator can then compare the photo to a real-time image from the camera above the door, which records all entry and exit activity from the storage room. The operator can then choose whether to release the door. When integrated into the control room, security information can inform process operators about the state of their site's security. Information about perimeter threats, visual confirmation from CCTV cameras, knowledge about what employees are in which areas of the plant, and other critical security information can assist those operators in determining whether a forced process shutdown is necessary to preclude an accident or the catastrophic consequence of an external threat. Integration and visual confirmation of plant conditions all add up to situational awareness, which is a must-have for many of today's modern plant operators to ensure the highest levels of plant safety and security. Many components of industrial security solutions, especially the advanced components, are designed around the needs of the specific site. These components range from explosion-proof camera solutions to sonar for detecting underwater intrusion. Technology in the security industry evolves very rapidly. Some of the most advanced technologies are being developed for Homeland and Critical Infrastructure security applications. These include things such as facial recognition, object tracking, "package left," and other video analytical capabilities. It also includes advanced perimeter sensor technologies such as radar, long-haul fiber, and others. Due to the rapid advance and site-specific nature of technology and its application, it is best to engage an industrial security consultant when selecting the solution that strikes the optimal balance between reducing risks and meeting budgetary constraints. Honeywell's Specialty Materials plant in Geismar, La., is occupied by five companies and produces several chemicals, including hydrofluoric acid and fluorocarbon refrigerants. 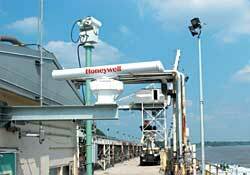 As host, Honeywell is responsible for the entire site's perimeter security, as well as security of the facility itself. Just as in other large chemical facilities, Geismar plant officials reexamined pre-Sept. 11 strategies such as emergency response procedures with local first responders and an around-the-clock security force. After Sept. 11, perimeter security, access controls, and communications systems were upgraded, but the company felt more modifications were needed. Today, the Geismar plant features an integrated security system that spans from access control readers that allow only authorized personnel into certain areas of the facility to radar technology that tracks approaching vessels on the Mississippi River. But Geismar also goes a step further. Because the building and process control systems share the same distributed server architecture, the plant's physical security system is also tightly integrated with process controls. Images sent from security cameras to security personnel, for example, also are sent to process operators, who can react by ordering workers to leave an endangered area of the plant or shut down a critical process that could cause massive damage if disrupted by an outside threat. Additionally, access card readers can let security personnel know exactly where evacuated plant employees are located, making it easier to coordinate with first responders during emergencies. The most important benefit of integrated security systems is reaped by plant personnel--both the workers at risk and the security and safety professionals who are charged with responding to the threat. An integrated solution designed to deliver maximum impact, such as the one employed at Geismar, takes more into account than just physical security. Whereas most safety professionals might first think of standard security cameras and extra guards at entrances when considering how to bolster security, a comprehensive solution requires the participation of every worker. Whether it is the security guard who calls in reinforcements to investigate a disturbance or the plant operator who brings a process to a safe state during an incident, every site worker becomes an element of an effective security and safety system. The most effective systems not only integrate security and safety solutions. They integrate those solutions together with the people they protect to increase awareness and improve response time.